When I pray this, I am addressing my heavenly father and my earthly father. 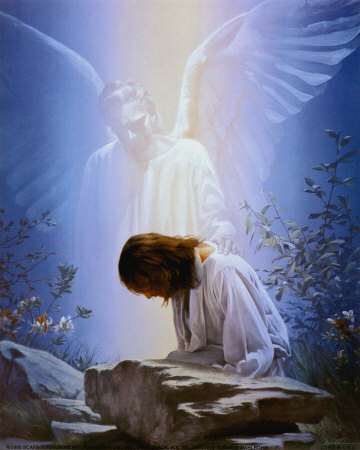 It has become so personal to me and I have a picture of my father whenever I come before my heavenly father. I know that when we surrender our lives to Christ, we have been ransomed from the grave. I was bought with His blood. My life no longer belongs to me. But He is at work in me and through me. I don’t represent myself on this earth, but Him. So though “I am in this world, I am not of this world”. I cannot be purchased by the material, since I’ve already been purchased by something which is more valuable than anything in this world. His blood. Because of this, I don’t desire to have recognition or wealth. My desire is to fulfill His will for my life. This means to honor my father, even in his grave. Yes, I’ve screwed up many times. I’ve had my heart breaks and tantrums. I’ve screamed at my heavenly Father, “take this away! I don’t want it!” I’ve told Him, like the Israelites, “I was better off in Egypt.” The pain of these experiences have left me feeling abandoned and rejected. So much sorrow, that I can relate to His experience on the cross. I understand that cry of anguish, “Daddy, where are you? Why have you left me?” Sure, maybe Christ didn’t use this vernacular, but the meaning was the same. My dad was a man who had faithfully served his country and his company. In the end of his tormented life, he was robbed by both. The only joy he had left was his job and his family. Now it had abruptly come to an end, by his own hand. I certainly couldn’t find any good which could come from this. But then again, when most people looked to the cross and our Lord’s crucifixion, I’m sure they thought the same. I’m sure that at the time, His disciples looked to His death as the end. That Satan’s plan had succeeded. But the end is only for those who have no hope. This was really the beginning. Our Lord told us that this is His very name. “The Alpha and Omega-The Beginning and the End.” Yes, now I am starting to understand how profound this message really is to mankind. Saved from what? Well, if I rounded up everyone who had brought harm to my earthly father and brought about this suffering, there wouldn’t be a prison big enough to contain them. As the heart of man is full of corruption, what purpose does prison serve? Besides being a drain on taxpayers, it only makes criminals worse. As I pursued lawyer after lawyer. One law enforcement official after another, to bring justice, I realize that man cannot offer the justice I seek. “One man cannot give his life for another.” This is not going to bring honor to my father or peace to him. Because we are in a corrupt world, our whole system is designed to reward criminals and punish the innocent. It is contrary to our God. Our Lords plan is always redemptive. His life for ours. He told us, “that the punishment that was meant to bring us peace, was upon Him.” This is not restoration, or reformation. These things are temporary and without power. But it is regeneration, which only comes by the power of the Holy Spirit of God. The same breath that our Lord breathed into Adam. This is only accessed through our true repentance and the acknowledgement of His sacrifice. So I pray to my heavenly father, “That His will be done, on this earth as it is in heaven.” As I do this I believe I am bringing honor to my earthly father, and in due time, my Lord will bring forth a harvest. So, with this in mind, I step out in faith. I allow Him to direct me in the plan. I pray that “He would open doors which no man can shut, and close doors that no man can open.” All with the complete faith that He is drawing the final harvest to a close. I am part of His plan and I am blessed to be His partner. In the end, whatever it takes, I pray I that I make both of my father’s proud.